You are at:Home»iPhone»Power»iPad Not Charging? Here’s Why & The Real Fix! iPad Not Charging? Here’s Why & The Real Fix! Your iPad is having a charging problem and you don’t know what to do. You plug it in expecting it to charge, but the screen remains completely black. In this article, I’ll explain what to do when your iPad is not charging and show how you to fix the problem for good! This article will help you identify exactly which piece is causing your iPad’s charging problem and show you how to fix it for good! The first thing to try when your iPad is not charging is performing a hard reset. Press and hold the Home button and the power button at the same time until you see the Apple logo flash onto the center of the screen. Sometimes you’ll need to hold both buttons for as long as 20 – 30 seconds. Why could this work? It’s possible that your iPad’s software has completely crashed, turning the display entirely black. If this is the case for your iPad, a hard reset would temporarily fix the software crash. If the software of your iPad is detecting fluctuations in power from the charger your using, it may be what’s causing the charging problem. Your iPad’s software sees the power fluctuations as a safety risk, so it’ll prevent your iPad from charging altogether. Try charging your iPad with multiple different chargers including every USB port on your laptop and the wall charger that came with your iPad when you purchased it. If you’re like me, you may also have a USB port built into your surge protector — try that too. If you find that your iPad is charging with some chargers, but not others, then you’ve identified that the problem was your iPad charger, not your iPad. If your iPad is not charging regardless of which charger you use, move onto the next step where we’ll help you troubleshoot problems with your Lightning cable. Next, closely examine the Lightning cable you’re using to try and charge your iPad. Is there any fraying or discoloration on the Lightning connector or wire itself? If so, it may be time for a new Lightning cable. To see if your Lightning cable is what’s causing the iPad charging problem, try charging your iPad with a different cable. If you don’t have an extra cable lying around, borrow one from a friend or check out our selection in the Payette Forward Amazon Storefront. 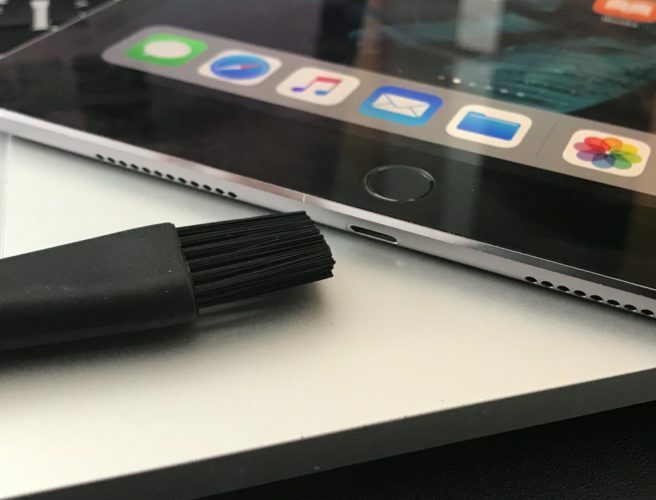 If your iPad starts charging with one cable but not the other, then you’ve figured out that your charging cable is causing the problem, not your iPad! Don’t Use Cables That Aren’t MFi-Certified! As a quick aside, I’d like to warn you of the dangers of using Lightning cables that aren’t MFi-certified. These are the types of cables you’d typically find at your local convenience store or gas station. These cables generally aren’t MFi-certified, which means they have conformed to Apple’s standards of a high-quality Lightning cable. Since these cables are lower quality, they can sometimes overheat and damage the internal components of your iPad. 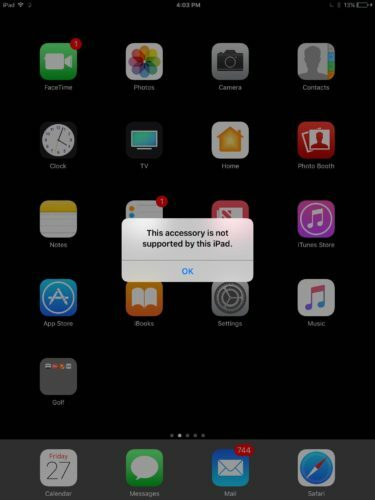 You’ll know a cable is damaged or not MFi-certified when your iPhone, iPad, or iPod says “This Accessory May Not Be Supported” after you plug it in. In short, always use MFi-certified cables when charging your iPad! You’ve tried multiple cables and multiple different chargers, so now it’s time to take a look inside your iPad. Grab a flashlight (the one built into your iPhone works great!) and closely inspect your iPad’s charging port. Specifically, we’re looking for any dirt, lint, gunk, or other debris that could be preventing your Lightning cable from making a clean connection to your iPad’s charging port. 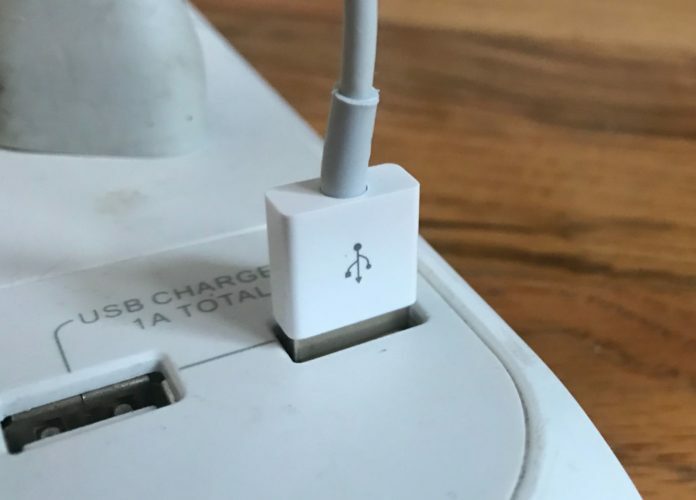 There are eight tiny pins on the inside of your iPad’s Lightning port that make a connection to your Lightning cable during the charging process. 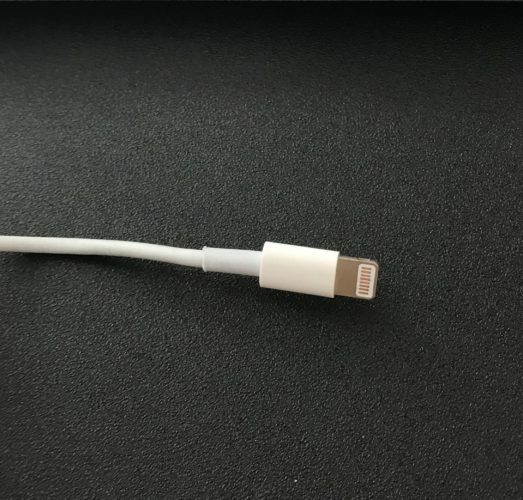 If any one pin is concealed by debris, it may not be able to form a connection with your Lightning cable. In most cases, it’s better to be safe than sorry. Even if you don’t see a ton of debris in your Lightning port, we recommend making an effort to clean it out. Sometimes minuscule specks of dust that you can’t even see are what’s causing the iPad charging problem. How Do I Clean Out My iPad’s Charging Port? We always recommend using an anti-static brush to clean out your the Lightning port of an iPhone, iPad, or iPod. Anti-static brushes don’t give off electric charges, which could damage the inside of your iPad while you’re cleaning it. Most people don’t have a fancy anti-static brush lying around, but a brand new toothbrush making an excellent substitution. Gently brush out what’s inside the port, then try charging your iPad once again. You may be surprised by how much debris comes out! If you’ve made it this far, you’ve ruled out the possibility of a minor software crash, an issue with your charger or Lightning cable, and a dirty charging port. We still have one last trick up our sleeve: the DFU restore. A DFU restore erases and reloads all the code on your iPad to its factory defaults. Ultimately, a DFU restore will help us fix a very deep software problem which could be the reason why your iPad is not charging. Check out our DFU restore walkthrough video on YouTube. We’ll show you how to put your iPad in DFU mode and restore it too! If a DFU restore doesn’t fix the charging problem, move onto the final step of this article. We’ll discuss how to check for water damage and what your best repair options are. Unfortunately, not every iPad that won’t charge can be fixed with a series of software troubleshooting steps. Sometimes you’ll have to get your iPad repaired. One of the most common reasons why an iPad experiences charging problems is because it was recently exposed to water or another liquid. That liquid can permanently damage the connectors inside your iPad’s Lightning port, making it impossible to charge. If you have to get your iPad repaired, we recommend two options: The Apple Store and Puls. If your iPad is covered by AppleCare+, scheduling an appointment and visiting your local Apple Store is probably your best bet. However, AppleCare+ doesn’t cover liquid damage, so they may only offer to replace your iPad for a pretty hefty fee. Puls is an on-demand smartphone and tablet repair company that will send a certified technician directly to your home, place of work, or favorite local restaurant. They’ll fix your iPad on-the-spot and cover the repair with a lifetime warranty. Better yet, Puls has Water Damage and Charging Port services, so they’ll be able to diagnose and repair the real reason why your iPad is not charging. Your iPad is charging again! Next time your iPad won’t charge, you’ll know exactly how to fix the problem. 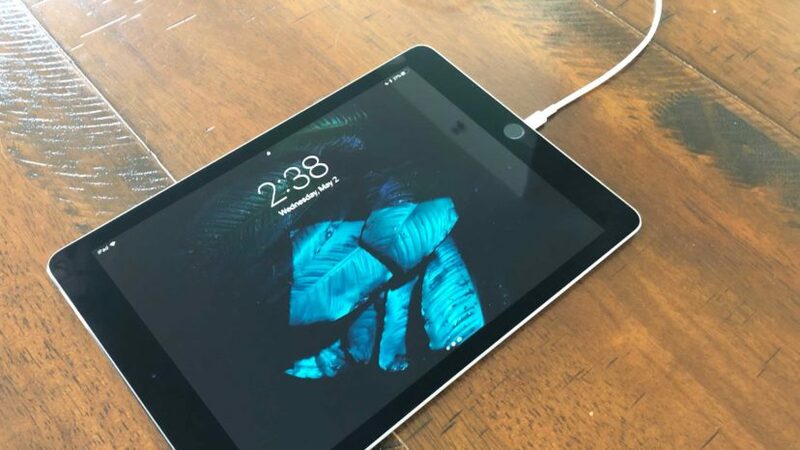 Don’t forget to share this article on social media, or leave us a comment down below to let us know the reason why your iPad was not charging. Previous ArticleMy iPad Won’t Turn On! Here’s The Real Fix. Next Article iPad Stuck On The Apple Logo? Here’s The Real Fix!